Home / Events / National Vitamin Day! Today is National Vitamin Day! Let’s celebrate by making a healthy pledge (or reviewing our vows) to continue to eat well rounded nutritious meals and snacks, exercise for at least 30 minutes on most days, enjoy quality time with our friends and family and commit to taking vitamins and making them a part of our daily routine. Vitamins are crucial for me and my active lifestyle running around New York city all day. I also feel that certain vitamins, especially this time of year, help support my immune system and keep me healthy and strong. Ever since I discovered Nature Made VitaMelts, it’s become so much easier to stay on top of taking my vitamins. I keep the zinc VitaMelts in my medicine cabinet and take one in the morning after breakfast while I’m doing my make-up and getting ready before brushing my teeth. I carry the VitaMelts vitamin C in my purse and pop them throughout the day usually one around 8am, 10am, one at lunch, another around 3pm, one with dinner, and maybe one before bed. You can have up to 8 a day. I also keep the VitaMelts B-12 in my purse and take one mid morning and one mid afternoon. I really see the difference when I have the little pick me up especially mid afternoon. I take my calcium at lunch and at dinner so I usually have one VitaMelts vitamin D on me and another one at home. I keep the VitaMelts Melatonin in my bedside table drawer and use them on nights when I really need to get a good rest or I’m having trouble falling asleep. I often take the Theanine VitaMelts after dinner to help me unwind and relax as well. Nature Made VitaMelts make taking vitamins so much more enjoyable. I love savoring the tasty flavors–juicy orange, mixed berry, creamy vanilla, honey lemon, green tea mint and chocolate mint, all of which are derived from natural sources. They melt in your mouth, no water needed, they come in cute, small, portable packages and everyone I’ve shared them with absolutely love them. Nature Made® VitaMelts™ are a new “one of a kind”, enjoyable way to take your vitamins because they melt in your mouth and taste great. Discover how new Nature Made® VitaMelts™ can transform your vitamin taking experience by making it enjoyable. 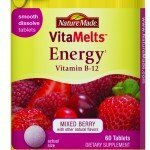 Visit us on NatureMade.com/VitaMelts to get a coupon. Disclosure: Compensation was provided by Nature Made via Glam Media. The opinions expressed herein are those of the author and are not indicative of the opinions or positions of Nature Made. übr water announcement & giveaway!